The geology of Walden Pond in Concord, Massachusetts is glacial—that's not unusual in New England—but the details of its formation, unusual. 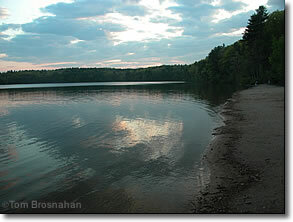 Concord's Walden Pond is a "kettle pond" formed when a huge iceberg-like chunk of glacial ice, buried in the glacial moraine, melted. The bottom of Walden still has the shape of the chunk of ice that melted here thousands of years ago. Walden is deep: over 100 feet (30.5 meters) in the middle. Because waters filter into it from surrounding sandy soils, the pond is essentially oligotrophic, that is, it has few organic nutrients, so few plants grow in it, keeping the water pure and clear. However, nitella algae, over 10,000 pounds of it, grows naturally in Walden's depths, as does lake quillwort, a plant that grows nowhere else in Massachusetts, and these growths help to give the pond its special character. But the "nutrients" added to the pond annually by thousands of swimmers, not to mention those contributed by visiting ducks and geese (fed by humans), and seepage from the park's toilets, may turn the pond eutrophic, contribute to the growth of algae and water plants, and upset its unique ecology. The problem is, quite simply, that Walden is beautiful and historic, and a lot of people want to enjoy its magic. Official efforts to control the number of visitors and their impact on the pond have been going on for over a century, with some success. Today Walden is a mecca for Thoreau and nature lovers, as well as a Massachusetts state park with a swimming beach, hiking trails, and a replica of Thoreau's little house. 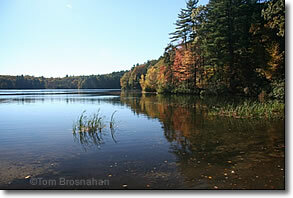 Walden Pond in Concord MA. 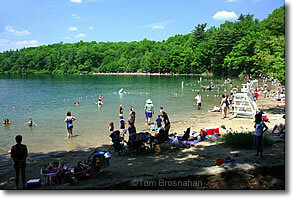 Below, Walden's beach in high summer.